The curriculum at the Higher School of Belgrade (1808–1813) included: during the second year of studies – Statistics of Serbia, Stylistics and geographical-statistical history of Hungary, Russia, England, France, Poland, Austria and Turkey; during the third year – Stylistics and geographical-statistical history of the aforementioned states, international law, State law, Criminal law and „ways of conducting criminal trials“. Analyses show that the total time devoted to legal studies was a year and a half, out of a total of three years. Furthermore, the duration of academic year, the number of teachers, the academic titles and the manner of teaching, all indicate that the Higher School of Belgrade was modeled after the Royal Academy from the neighboring Hapsburg Empire. It is therefore justifiable to state that the beginnings of the modern legal education in Serbia and the tradition of the Faculty of Law in Belgrade can be linked to the Higher School of 1808. Higher education in Serbia continued at the Lyceum, founded in 1838 in Kragujevac. In 1840, after graduating from the two-year General (Philosophy) Department, a one-year Law Department was introduced. In autumn of 1841 the Lyceum was relocated to Belgrade, and situated in a nondescript municipal house in today’s Kralja Petra Street, opposite the National Bank of Serbia and an elementary school. The Lyceum remained here for three years, before it was moved to the Residence of Princess Ljubica. In order to raise the level of teaching and scientific research it was necessary to introduce changes and novelties. According to the Act on public education system of September 23/ October б, 1844, studies at the Philosophy Department lasted two years, and then two more years at the Law Department. New subjects were also introduced. It was decided (February 4/17, 1849) that studies at the Law Department should last three years, thus the overall studies at the Lyceum lasted five years. Even then, the curriculum of law studies „manifested certain tendencies of a university education“, and Natural law, the Institutions of Justinian, Justinian’s Digest or Pandects, Civil law of Serbia, National law, Criminal law, Civil and criminal proceedings, Public law of Serbia were among the taught subjects. By the end of this period, around 20 gymnasium graduates on average were enrolled at the Lyceum, of which about a third completed their studies. Despite many shortcomings, underdevelopment and exiguity, as well as the surroundings in which it was founded, the Lyceum gradually, almost imperceptibly, paved the road for the „Europeanization“ of the Serbian society. The main contribution to this process was given by its professors. At the beginning they were exclusively Serbs, and others, from the Hapsburg Empire. Later on they were joined by „sons of the fatherland“ who were mainly educated in German countries, as well as those who completed their studies in France, although both were called „Parisians“. German textbooks were almost exclusively used for teaching, even after the Law of 1844 prescribed the publishing and use of Lyceum’s own textbooks. Since 1853 law studies became independent from studies of philosophy. In 1863 the Lyceum was transformed into the Higher School. Article 1 of the Law on Higher School Founding (of September 24/October 7, 1863) prescribed that it is a „scholastic institution for higher and professional education“. 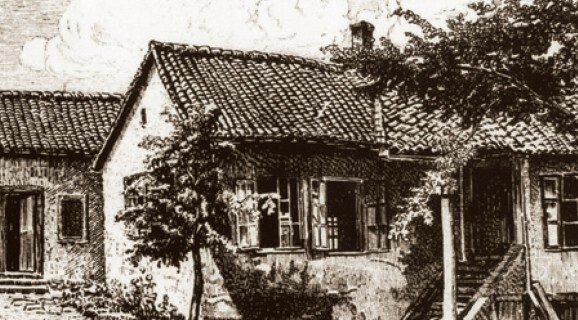 Immediately after its founding, the Higher School was situated in the edifice that Miša Anastasijević, „Captain Miša“, bequeathed to his fatherland in February 1863. The Higher School occupied part of the ground and first floor. As this majestic edifice was also occupied by the Society of Serbian Letters, National museum, National library and two high schools, the building soon became overcrowded. Insufficient space was especially disturbing for the normal functioning of the Higher School and its Faculty for Legal Studies. The Higher School had three faculties: Philosophy, Legal studies and Engineering. Studies at the Faculty of Philosophy lasted three, and at the Faculties of Legal studies and Engineering four years. The aforementioned Law did not grant the Higher School autonomy it its work. The Minister of Education could appoint adjunct teachers without consulting the Academic Council, composed of professors from all three faculties. The Rector was elected by the Monarch on the proposal of the Minister; the Law did not prescribe conditions for selecting teachers. According to contemporaries, the Minister of education, with a doctorate degree of the Heidelberg University, prepared an unsatisfactory law which took into account the political views of Prince Mihailo, rather than secured the autonomy of the Higher School and the freedom of scientific research. Emphasized even then, these high demands have remained to this day a constant aspiration of professors and students of the Higher School, later the University, and of the Faculty of Legal Studies as its integral part. Improvements were made by the Amendments of the Law on Advanced School Founding of 1896, which for the first time enabled the Higher School and the Faculty of Legal Studies to adopt their own decrees which, truth to tell, had to be approved by the Minister of education. 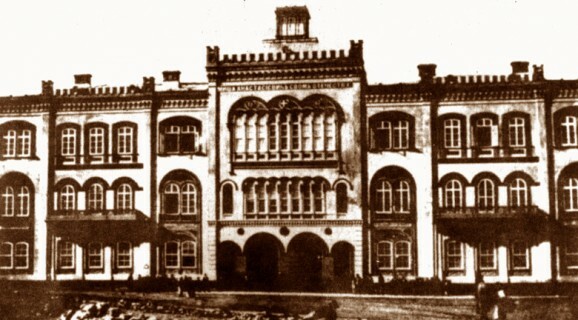 The higher School and its Faculty of Legal Studies became quite prestigious due to their most prominent professors, who studied at leading European universities and subsequently, as representatives of their respective departments at the higher School, maintained cooperation with their tutors and colleagues. This institution where high standards were set – a full member of the European academic community – soon outgrew its name. Demands from the public and from many professors of the Higher School could no longer be ignored. Thus, on February 27/March 12, 1905, King Peter I signed the Decree on the enactment of the Law on Universities. This legal act granted the University autonomy, stating that“the teachers are free to present their knowledge“. Teachers of the Faculty of Legal Studies, as well as other teachers employed at the Higher School at that time, were put at disposal and stricter criteria were applied to determine their university titles (professors, associate professors and assistant professors). Numerus clausus (a limited number) was introduced for all titles, and the Faculty of Legal Studies could have four professors at the most. After being upgraded to the level of University, it obtained the right to issue doctorate degrees. The General Decree of University of October 1/14, 1905 and the Law on the Faculty of Legal Studies of February 1/14, 1906, contained provisions regarding „doctorate exams“, i.e. on conditions for acquiring the degree of Doctor of Law. Since 1907, doctoral dissertations could be defended at the Faculty of Legal Studies of the University in Belgrade, and until 1941, 98 doctoral dissertations were successfully defended. An important event in the history of the Faculty was the publishing of the first issue of the law journal Archive for legal and social sciences (February 25/March 10, 1906) prepared not only by professors of the Faculty of Legal Studies in Belgrade, but also by distinguished scholars from the Slavic south and from all over Europe. During the Balkan Wars (1912–1913) lectures were disrupted, and throughout World War One, the Faculty of Legal Studies, as well as other faculties of the University in Belgrade, was closed. The Faculty of Law was the most important academic institution of this kind in the Kingdom of Yugoslavia, and it also attained a high international reputation. On the eve of the Second World War, more than 4000 students studied at the Faculty (one quarter were female students), and their tutors were a dozen or so professors greatly acclaimed both at home and abroad. The successful period between two world wars ended with the completion of the construction work (in 1940) on the building where the Faculty is located even today. Gloomy forebodings were indicated by the postponing of the grand opening of the building anticipated for March 30, 1941 at 10:30 AM. The professors and students of the Faculty of Law were one of the most active centers of resistance to fascism and war, which could already be anticipated. Most student organizations, of both civil and leftist orientation, established the United Student Youth movement, and their antifascist and antiwar views do credit to them, but also to later generations in their defense of the greatest values of our civilization. Because of its antifascist orientation, the Faculty of Law, as well as the entire University of Belgrade, would bear heavy consequences during the period after the outbreak of the Second World War. When the country was occupied by Nazi Germany, the Faculty of Law and the University of Belgrade were closed. During the occupation only some pending exams were held. Occupying German forces moved into the building of the Faculty of Law. The loss of human lives was great. A large number of students were active members of the resistance, and many of them lost their lives. Professors Đorđe Tasić and Mihailo llić were imprisoned in the Nazi concentration camp, where they were shot. 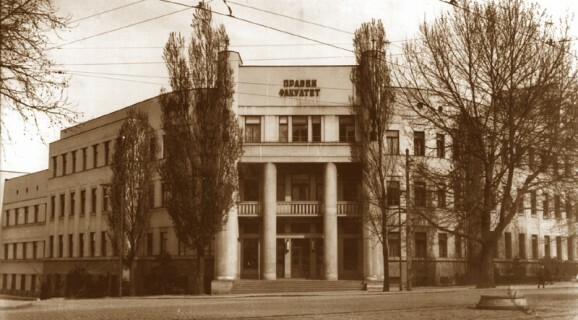 After the liberation of 1945, the University and the Faculty of Law in Belgrade were reopened by the new communist government, but a number of pre-war professors were removed for ideological reasons. In the postwar period the University and the Faculty of Law in Belgrade were placed under political control. In spite of the factual influence of the Communist Party on personnel matters, elections for faculty ad ministration and the conferral of academic titles were performed by the academic community and this task was mainly performed in accordance with high university standards. Continuity was enabled by prewar professors who had educated a worthy scholastic progeny. With the opening of Yugoslavia to the world during the 50s, prewar contacts were renewed and lively cooperation with foreign institutions and individuals was initiated under these new conditions. 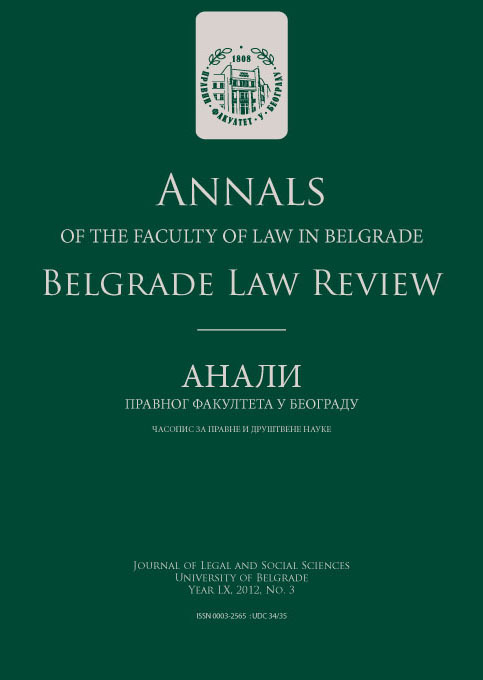 Since the Lawyers’ Association took over the law journal Archive for Legal and Social Sciences in 1948, a new faculty journal was launched entitled Annals of the Faculty of Law in Belgrade and its first issue was published in 1953, which exists to this day and even has its English edition. In the postwar period, the Faculty of Law in Belgrade, as well as other faculties of law in the country, went through a number of legal regimes which were regulated by federal and republic laws on higher education. Accordingly, several statutes were adopted.The first Statute was adopted in 1956.The Statute of 1961 introduced master’s studies. From 1945 to the present, 142,342 students have enrolled in the Faculty of Law, University of Belgrade, of which 45,170 have graduated and acquired a law degree. Of this number 1278 graduates acquired the title of magistri iuris. Since 1949, 924 doctoral dissertations have been defended. The professors and students would not be universitas without a library. Its beginnings were also modest. In 1850, the entire Library of the Lyceum had only 552 volumes in its inventory. The Library of the Faculty of Law, according to a report from 1943, stored 25,000 books and journals. Today it is one of the largest and finest law libraries in this part of Europe whose collection comprises 94500 monograph titles and 2926 titles of serial publications.The carefully preserved priceless collection of rarities and unique volumes has about 100 books. Professors and associates of the Faculty of Law, University of Belgrade actively participate in international scholastic cooperation; they cooperate with colleagues from other countries, and participate in the work of foreign academic institutions. The Faculty of Law broadly cooperates with faculties, scientific and other institutions in the country, in the organization of scholastic and professional gatherings, promotions and other similar events. The Faculty has received numerous recognitions from the community, such as the Vuk Karadžić award (1976), the Order of Merits for the People with gold star (1977), the Sveti Sava award (2011).These prestigious awards received from the most important bodies were significant, but so were the expectations. Three events testify to the level of significance and hopes that were attached to law studies and the Faculty of Law in Serbia. On August 31, 1808, Karađorđe Petrović, the leader of the Uprising, attended the founding ceremony of the Great School in Belgrade, as did the president and members of the Governing Council, and many other champions of the Uprising. The first public exam at the“newly established Law department“ of the Lyceum was held on February 3,1841, and was attended by Prince Mihailo Obrenović, his representative and Minister of foreign affairs Đorđe Protić, Minister of education Stefan Radičević and members of the Governing Council, i.e. the entire state leadership. The Prime Minister of the Kingdom of Yugoslavia Dr. Milan Stojadinović, a former student, doctoris iuris and adjunct professor at the Faculty, placed the Charter into the foundations of the present day faculty building during the July 7, 1937 ceremony marking the commencement of construction works. In gratitude to the community in which it was founded, in addition to generations of lawyers, the Faculty of Law has educated a great number of renowned scholars and produced numerous works, which attained the highest achievements in Serbian and Yugoslav jurisprudence and culture. Its influence has surpassed the borders of the community it originated in, and the Faculty has become one of the most prominent law schools of this part of Europe. Understanding of the rich tradition and modern surroundings are the guiding principles of the Faculty of Law in its education of future lawyers based on the best traditions of legal studies, and in its contribution to the development of the Serbian legal system. The term “Law” was exclusively used for the first time in the Law on the Faculty of Law of August 5, 1928, whereas in previous documents the term Faculty of “legal studies” was more commonly used.